It’s taken a while, but Apple has finally got its iBookstore up and running in Japan, bringing with it a large selection of e-books from major publishers in the country. There had been an iBookstore of sorts in operation in Japan before now, though it was only offering free and public domain titles. Announcing the launch in a release, Apple promised a wide range of content from both emerging and established writers, including the likes of Shyotaro Ikenami, Jiro Akagawa, Atsuko Asano and Ryu Murakami. Murukami, perhaps best known beyond Japanese shores for Audition (later adapted for the big screen by Takashi Miike), said in the release that as an Apple user for 20 years, he was “excited” by the tech giant’s news. “As an author and Apple user for 20 years, the arrival of the iBookstore allows me to tell stories in a way you simply can’t in a physical book,” the writer said, referring to special features incorporated into his e-books, including I’ll Always Be With You, Always, which has interactive emails in each chapter. I’ll Always Be With You, Always is, incidentally, one of three Murakami books being offered exclusively by Apple’s iBookstore. In Japan – population of 128 million – the iPhone and iPad are hugely popular devices, so the new market has the potential to be a massive money-spinner for Apple. Admittedly, it’s been a bit slow getting distibution deals sorted with publishers in the East Asian nation, with rivals Google, Amazon and local player Rakuten (with its Kobo tablets and e-book store) already having established a presence in the country with their various e-book/reader/tablet offerings. Amazon’s Kindle bookstore and Paperwhite e-reader hit the Japanese market last October, with the cheapest model currently selling for 7,980 yen ($85), the same price as Rakuten’s Kobo Glo device. Rakuten also sells two other e-readers, both going for 6,980 yen ($75). With the addition of Japan, Apple’s iBookstore is now operating in 51 countries, with e-books – both free and priced – offered across a wide range of categories, including novels, biographies, cooking, history, and children’s books. 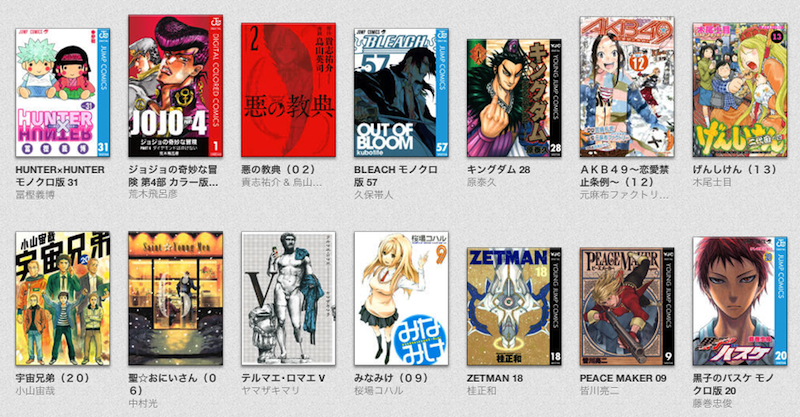 As you might expect, Japan’s iBookstore also includes a well-stocked manga section.